Boynton going against his background of man defense out of necessity. STILLWATER — Members of the Oklahoma State basketball team met with the media Thursday. Here are some of the highlights from Boynton and Co.’s interviews. Tanner Taylor still has a moment of panic when Mike Boynton asks for a white board. That feeling then fades as Taylor remembers he is a player now, and those aren’t his duties anymore. One duty Taylor has had to add since being added to the roster was the team’s workouts, something he is working through the soreness of. There are six other newcomers practicing with the Cowboys, but none of which have been added to the roster yet. Taylor’s entrance to the squad was different in that he didn’t participate in the walk-on tryouts. As a two-year manager, Boynton knew what he needed to of Taylor. Saturday was the first time Taylor was on the bench as a player. He said the feeling was hard to explain, but he could definitely feel the energy of putting the cursive lettering of Cowboys across his chest. Although he didn’t check in, Taylor’s parents came down to watch Saturday’s game, and Taylor said he thinks they’ll be in Gallagher-Iba Arena again Saturday when the Cowboys face Kansas State. Taylor said he FaceTimed his parents for about two hours when he told them the news that he was joining the team. Wednesday, it was announced former OSU assistant Lamont Evans pleaded guilty to a federal bribery charge stemming from the FBI’s investigation into college basketball. 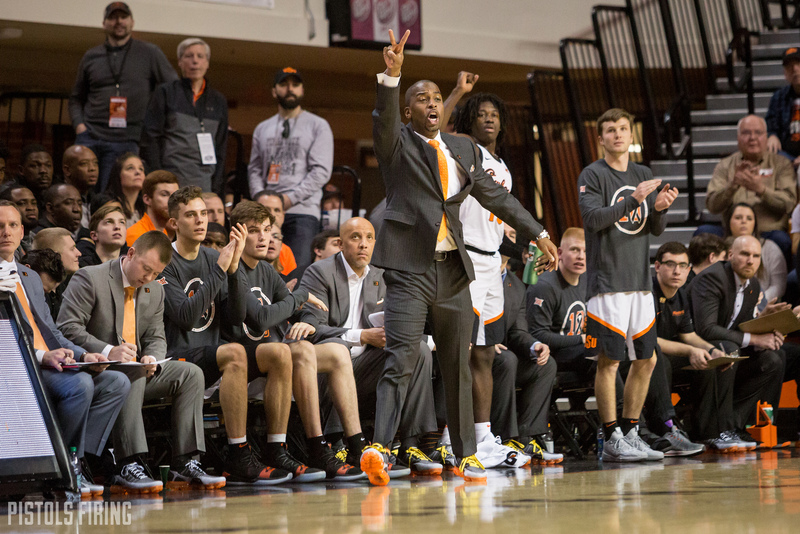 Evans was arrested and fired as a part of Mike Boynton’s staff after Evans chose to stay in Stillwater after Brad Underwood left for Illinois. “It’s an unfortunate situation,” Boynton said. “I still believe in my core that Lamont’s a good person caught up in a tough situation. I still continue to pray for him and his family. Every February, Mike Boynton goes on a diet of only nuts, fruits and vegetables, and after considering not doing it this season, he has decided he’s going to do it again. With Thursday being his last day of freedom, Jenny, Boynton’s wife, who is also a dietitian, is in charge of his last supper. “My wife’s really good about making sure that tonight I get nice and stuffed,” Boynton said. “January 31st and March 1st are like her favorite two days on the calendar. Boynton was taught in the Henry Iba school of tough-nosed, man-to-man defense, but with a small bench, he has had to expand his defensive knowledge. “I’ve studied coaches all my life and obviously grew up in the northeast,” Boynton said. “Knew (Hall of Fame coach) John Chaney, who was a big proponent of a zone, and (Syracuse coach Jim) Boeheim, I don’t know if he’s ever coached a possession of man-to-man defense in his life. Two of the greatest coaches ever. Boynton said the 1-3-1 has probably been his team’s most efficient defense since the roster trimming. He put Cameron McGriff at the top his 1-3-1 zone, a spot where coaches sometimes put a guard. McGriff made that decision pay off Saturday with two steals and a handful of deflections.